^ 1.0 1.1 Ghandi, Rajmohan. 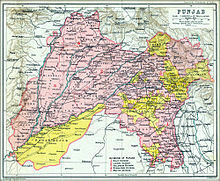 Punjab: A History from Aurangzeb to Mountbatten. New Delhi, India, Urbana, Illinois: Aleph Book Company. 2013. ISBN 978-93-83064-41-0. ^ Canfield, Robert L. Turko-Persia in Historical Perspective. Cambridge, United Kingdom: Cambridge University Press. 1991: 1 ("Origins"). ISBN 0-521-52291-9. ^ Shimmel, Annemarie. The Empire of the Great Mughals: History, Art and Culture. London, United Kingdom: Reaktion Books Ltd. 2004. ISBN 1-86189-1857. ^ 参见: Evolution of Heroic Tradition in Ancient Panjab, 1971, p 53, Dr Buddha Parkash.